Covered in multimedia lecture #1645. No other event or series of events in history has had nearly the impact of the Industrial Revolution. Most likely, people living in the 1700's could more easily relate to the lifestyle of ancestors 2000 years earlier than to our lifestyle a mere 200 years later. Our life expectancies are more than double that of our ancestors. We travel thousands of miles much more easily, quickly, and comfortably than they could travel 20 or 30 miles. We are in much closer touch with events on the other side of the globe than they were with events in the next village. And the price we pay for our medical care, balanced diet, rapid transportation, and mass communication involves much less effort than what they spent for their more primitive comforts and necessities. Although industrialization happened rapidly, one can see a long steady build-up toward it in Western Europe over many centuries. The extensive use of water wheels, windmills, and other labor saving devices all put the European mentality in touch with exploiting natural forces and laws to increase productivity. The invention of the clock changed Europeans' attitudes toward time, disciplining and regulating their lives to a degree of precision necessary for industrialization. And the Enlightenment's scientific discoveries laid the foundations for the dramatic industrial and scientific advances of the 1800's. All of these developments took place in Western Europe because of a complex variety of forces that fed back on one another to intensify their effects. Just as various forces combined to make Western Europe the birthplace of the Industrial Revolution, several factors combined to focus on Great Britain as the specific area of Europe where industrialization would first take root. One of these was a rapid growth in agricultural production and the labor force that started with the agricultural revolution in the Middle Ages. This led to three lines of development that would later converge to create a new agricultural revolution in the 1700's. First of all, the three-field system developed in the Middle Ages required nearly all the farmland for growing grain crops. This left little land for grazing cattle, which, in turn, produced little manure for fertilizer. As a result, crop yields were down, forcing peasants to use most of the land for grain crops, and so on. This made the agriculture fairly stagnant and created the need for a better way of feeding Britain's population. Another medieval innovation, the heavy plow, also generated a vicious cycle. Since peasants were typically too poor to own enough oxen to pull a plow, they had to share plow teams. As a result, they broke their fields into strips in order to ensure that everyone got at least some of his land plowed. This left everyone's lands interlocked in scattered strips of farmland. Because of that, there was little incentive or opportunity to try new agricultural techniques, since all the peasants had to agree on any changes and switch all of the village's lands to the new system. Getting everyone to agree to any such changes was extremely difficult. As with the three field system, this also made agriculture fairly stagnant, keeping individual peasants too poor to farm independently, forcing them to continue sharing plow teams, and so on. This also created the need for better agricultural techniques. However, another result of the medieval agricultural revolution, the rise of towns in the High Middle Ages, unleashed forces that pushed for change in two ways. First of all, by the early modern era, the rising middle class had bought up much of the farmland in their ambitions for secure investments and noble titles. These landowners were more open to new farming techniques that could earn them more profits. Second, the Enlightenment was discovering new ways to grow better crops. These two factors led to the four-field system that used all four fields rather than leaving one fallow. This had three advantages. First, it made previously useless and marginal land useful, thus expanding the amount of land under cultivation. Second, it used clover and turnips in the fourth field to maintain the soil’s fertility. Finally, with the fourth field now in use, it was using all of the land every year rather than having to keep part of it fallow. 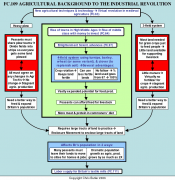 These factors led to better crop production so that peasants could afford feed for livestock, leading to more meat and protein in the common people's diet. Unfortunately, this new and more efficient agriculture required large open tracts of land. In the 1700's, the need for better agriculture and the need for large tracts of land for this new type of agriculture led to the Enclosure Movement, whereby wealthy landowners enclosed the common lands so they could practice the four-field system. This created two effects that helped lead to the Industrial Revolution. First of all, the Enclosure Movement drove many people off their lands, forcing them to flock to the cities in search of homes and jobs. Also, this new kind of agriculture doubled food production, thus leading to dramatic population growth in England in the 1700's. The combination of population growth in the cities created the labor supply for Britain's textile mills when the Industrial Revolution began.